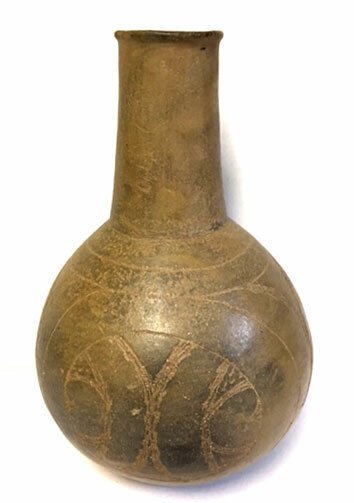 A Nice, Blond Color, Visibly Aged And Well Made, Caddoan Hatchel Engraved Waterbottle That Exhibits Surface Sheen Aging And Clay Coloration Patination, Evident Aged Surface Engraving Decoration, Visible Inside Aging And Deposits, Aged Open Pit Firing And Firemarking, Aged Surface Shell Grog, Correct Polished Bottom Wear, Correct Shape Vessel And Style Decoration For The Type, Correct Material And Manufacture For The Area Found. Found By Hershal Kitchens 12 Miles South Of Lewisville, Arkansas In 1957 Or 1958. Ex-Herschel Kitchens, Sam Johnson And Tom Vaughn ( # 1156 ) Collections. Includes A Ken Partain Certificate Of Authenticity.